Stackable counter stool with a steel sled base and finished in polished chrome, white or black. Thermo-polymer seat and backrest available in several colors. Optional fully upholstered shell or parallel upholstery stitching. The upholstered version includes a stacking protector. 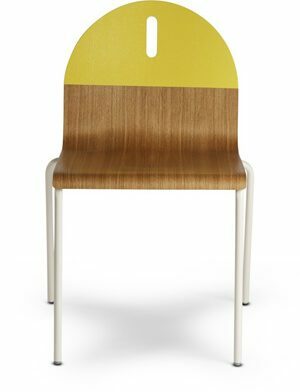 The Flex High Back has the same simplicity and versatility as the Flex Collection however its slightly higher backrest provides a distinctive aesthetic and personality. It is the perfect office chair and an elegant option for restaurant projects or large assemblies.